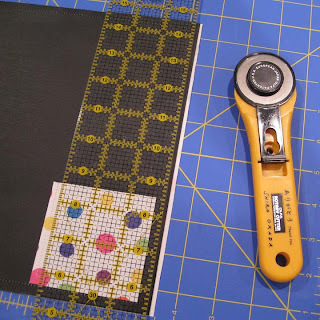 I was inspired by the wonderful tutorial over on Little Pumpkin Grace and Hudson too's blog (click to see her instructions). I would say, in general, I followed her steps. However, I made some alterations to what she outlined and thought I would share those. Step one: Buy supplies and figure out where the heck to buy chalk cloth. I ended up buying my oil cloth from Joann's. Limited selection, but I could take it with me that day. 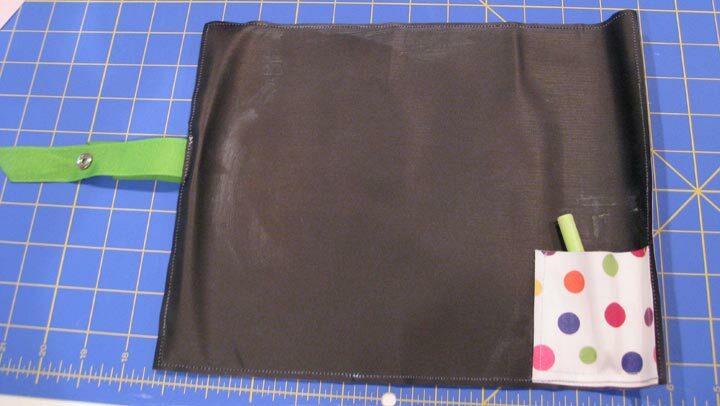 If I had realized I was going to have to order the chalk cloth, I might have decided to order my oil cloth online. Step two: Wait anxiously for it to arrive. Is it bad that I forgot that I ordered it until this heavy tube showed up in my mail? I will say it did show up in plenty of time for me to make ten mats! Step three: Cut out chalk cloth, oil cloth pocket and backing to size. I cut the chalk cloth and backing piece roughly 9.25" x 11.75". 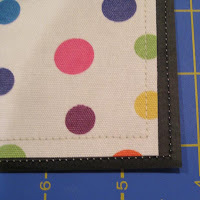 The pocket was cut about 3" square. You can obviously modify this to whatever dimension you want, but these make a nice tight roll. At this point, you might also want to prep the chalk cloth by rubbing it with chalk all over and then wiping it with a damp towel. It's just nice to not have to worry about that after you've sewn it together. Step four: Use black thread in the bobbin and matching thread for the oil cloth. 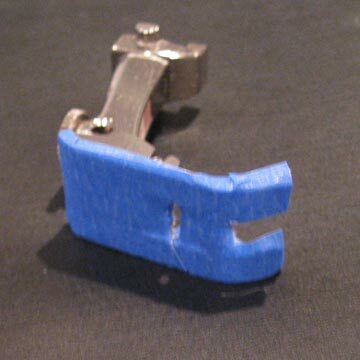 Step five: Try sewing using regular presser foot and then replace with walking foot. I did try Jessica's tip on using painter's tape to hold everything together, but she must have better tape than I did because mine just kept falling off ... typically with the ribbon that I needed to sew on. Step six: Remember to sew the pockets on first! I backstitched both when I started and stopped to make sure that we wouldn't have any issues with the pocket pulling off. I had my needle set all the way to the right and stitched about an 1/8" seam allowance on the sides and about a 1/4" on the bottom. There's no real rationale other than I liked the way it looked. Feel free to experiment. 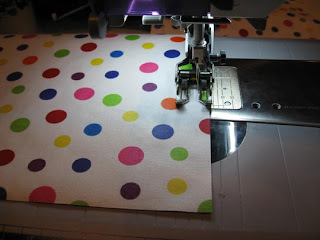 You might even try a zig-zag or other fancy stitch to dress it up! 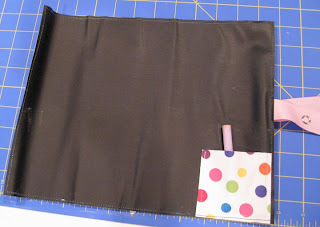 Step seven: Remember to sew the ribbon on the opposite side of the pocket. I figured out that it's much easier if you put the chalk in the pocket and then roll the chalk into the mat so that the chalk is buffered by all the layers of the mat rather than rolling toward the chalk and having the pocket near the outside of the roll ... does that make sense? Anyway, if you do that, then you need the ribbon to be opposite the pocket so you can actually close the roll up. Step eight: If you forget to sew the ribbon on, don't worry you can still attach it! If you forget to sew the ribbon on just go back and line up your ribbon on the stitching line. Do a single backstitch when you start and stop just to make sure that your ribbon won't pull loose. Trim the thread close to the mat on both sides. Step nine: Trim up the edges. And be careful with the ribbon! I trimmed all the edges to an 1/8" seam allowance since it was chalk cloth and oil cloth and they won't fray. I simply took the ribbon and folded it back under the oil cloth. The thing to remember is that because you're trimming it up with such a small seam allowance you really need to finger press the ribbon back so that you won't cut it. And yes ... I did learn this from experience. It's also how I know you can go back and sew the ribbon on afterward :) See I figure out all the wrong stuff to do first so you don't have to! 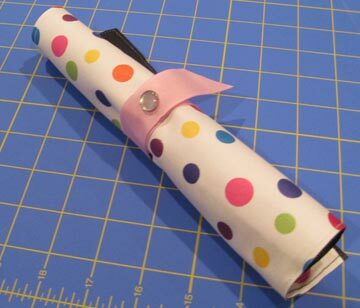 Step ten: Seal ribbon ends and add the button. I used pearl snap buttons that I had in my random stash of buttons. These are the kind that have four parts. I ended up rolling up the mat and checking to see where I wanted the button to be. I started with the female side of the button (the non-fancy side) and using a spare block of wood and a hammer I pounded the two pieces together. I then did the same with the male side of the button (the pearl button side). I used a towel to help buffer the button from the hammer blows and tried to be gentle. Step eleven: Enjoy all your hard work! Here's how I had them laid out for the kiddos. I was really happy with how quickly this project came together and if it weren't for those darn phalates in the chalk cloth I'd be adding these to my Etsy store. Maybe one day ... as I mentioned above, they do make phalate free oil cloth called laminated cotton and it's a bit on the pricey side, but it sure is pretty! You are so crafty!! I aspire to be crafty like you. 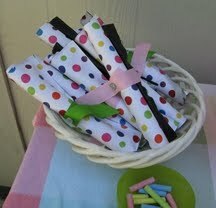 These are so cute and such a good idea as a party favor! !